When it comes to the best films set in a casino, some of the most intense, thought-driven scenes rarely depict them as being in a casino. For example, take “Rain Man,” a comedy-drama directed by Barry Levinson. Towards the middle of the film, we see Charlie Babbitt (Tom Cruise) realise his recently-discovered brother has a rare case of autism that allows his mind to calculate enormous sums, within seconds. 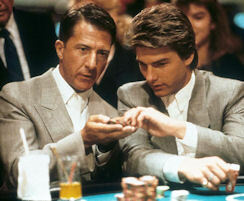 As Charlie understands the power and what Raymond (Dustin Hoffman) is capable of, he decides to head to Las Vegas and hit the casinos in a chance to make a fortune, and funnily enough he does it. In another popular genre, heist movies, you have the Ocean’s franchise, which is a span of multi-movies about a group of top thieves. The films stars many of the highest paid stars in Hollywood. The first film’s main character, Danny Ocean (George Clooney), and his partner in crime Rusty Ryan (Brad Pitt) get together again after another heist that left Danny in jail previously. In the film, they set out to steal large sums of cash from a casino owner’s vault that is heavily protected with state-of-the-art technology. They execute the mission successfully with a few interesting twists and turns. As we know, going to a casino you’re most likely to gamble – it’s not rare to do this activity, it’s part of a casino. You get to see this often from James Bond, from his popular, high grossing 007 film series. In the 2006 movie “Casino Royale,” the action-man (Daniel Craig) is seen enjoying his signature drink, a “martini … shaken, not stirred.” It was filmed in the Adjacent hotel in Karlovy Vary, Czech Republic. While in Siena, for 2008’s “Quantum of Solace,” you are able to see the specular Palio event, which is a type of horse racing. An if you have ever wanted to know more about horse racing, Timeform have an informational guide about the famous and glamourous Grand National event. We should also discuss 2014’s drama-thriller “The Gambler,” which follows Jim Bennett (Mark Wahlberg), a literature professor and known gambler around his town. He usually does his gambling in underground, mob-owned casinos. This lifestyle isn’t the most popular, as borrowing money to gamble at casinos from mob bosses always ends in physical fighting. But “The Gambler” has its ups and downs, and his complicated life does conflict with his personal life – in the form of co-star Brie Larson, who plays Amy Phillips. She works inside the casino Jim Bennett where does his gambling. The story doesn’t only consist of gambling, but the relationship and the bond the two characters create. And finally, comedy is the genre is for the light watchers, as screenwriters and director will always make sure they joke, and skits are universal for every watcher. The most famous casino comedy is “The Hangover.” The film is set in the amazing Las Vegas strip, and filmed inside Caesars Palace. The story revolves around three friends (Bradley Cooper, Ed Helms and Zach Galifianakis) finding their friend Doug (Justin Bartha) after a night fueled by alcohol and drugs – due to Alan, played by Galifianakis, making their night more eventful by secretly slipping “Roofies” into their drinks. The night begins from there, only to find the next opening scene having only three of them wake up from the cold floor and couch.